NASA just released the first frame of the high-resolution scans of Pluto. 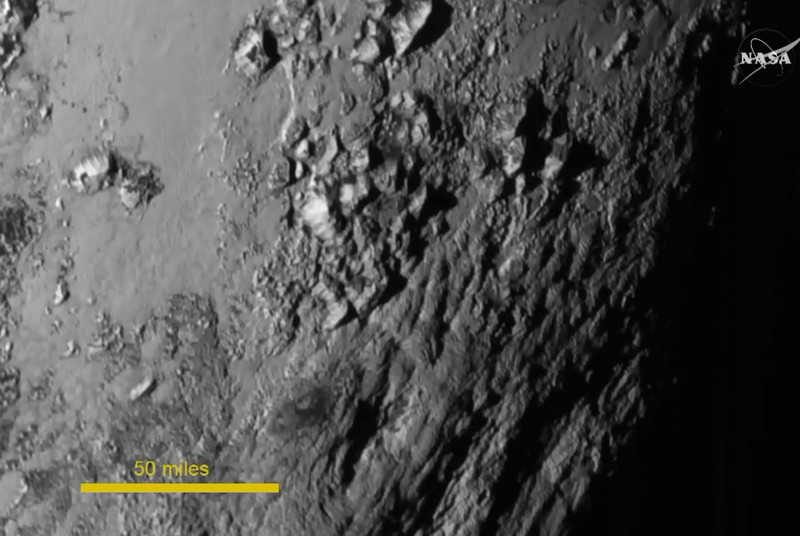 The new image is zoomed into less than one percent of Pluto's surface. It was published less than 24 hours after NASA received confirmation that the New Horizons spacecraft successfully completed its flyby of Pluto. More of these scans will be released on Friday. 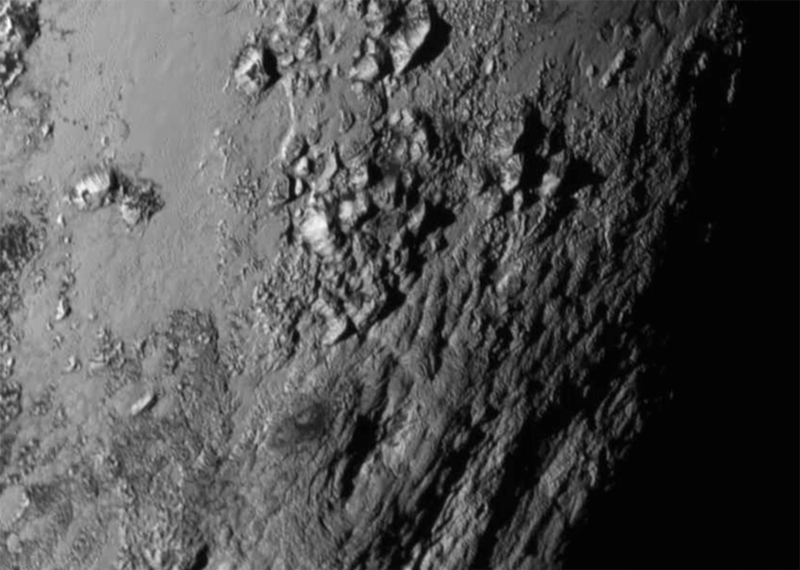 The high-resolution image of Pluto's surface shows us a fraction of the lower left portion of yesterday's image. John Spencer, a New Horizons science team member, said that the team has yet to find an impact crater in any of the scans, which means Pluto is very young relative to the rest of the solar system. Spencer also said that the mountains seen in the image stretch to over 11,000 feet (about 3,350 meters) high, and are likely made of a type of water-ice bedrock. The mountains probably formed less than 100 million years ago, according to NASA. They might also still be growing. That's counterintuitive to the way we've previously viewed icy worlds, which are typically only geologically active if they're orbiting much larger bodies. (Take Saturn's moon Titan, for example, which has visibly active cryovolcanoes that are aided by Saturn's massive gravitational pull.) While there are no immediate signs of cryovolcanoes, the New Horizons team will be looking for them when they get more high-resolution scans. They might also be visible in the images taken from the backside of Pluto, when the dwarf planet is back-lit by the Sun. Spencer said that this one image is already making the team rethink how the geological activity on these worlds is powered. Alan Stern, New Horizons' principal investigator, agreed. "The one thing we can say for sure is that tidal energy is not at play here," he said. "[Now] we have to get a little more clever." The team also announced that the "heart" feature of Pluto will now be known as the Tombaugh Regio, after Clyde Tombaugh, the discoverer of Pluto. The images that NASA released over the last few weeks were interesting because it was the first time we had seen Pluto in any real detail. But now, New Horizons has made its observations and is safely beyond Pluto. NASA will spend the next 16 months analyzing that data, releasing both images and scientific observations along the way. This image — and the images of the moons Charon and Hydra — is just the beginning.